Last night the NFL season kicked off as the defending Superbowl Champion New Orleans Saints played the Minnesota Favres in a rematch of last year’s NFC Championship game, yielding the same result: a Saints victory. Before the game, however, players on both teams made a statement by holding up one finger as a solidarity gesture. The move was intended to show that the NFL players union is united (duh, as “union” implies) in the intense debate over a new labor deal with NFL owners where both sides will end up with a ton of money. The NFL money fight is front & center instead of behind closed doors, where it needs to be. 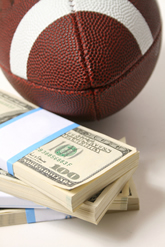 Fans who supply the league with dollars want to see football, not financial frustration. Unfortunately, the fans don’t get a chance to collectively give the middle finger to the entire NFL: players and owners alike.